On the morning of 26 March a young surfer named Ibrahim Arafat left the Gaza Strip via the Erez Crossing and entered Israel. He had with him a single suitcase and a US visa. His exit marked the beginning of a remarkable journey to Hawaii and the spiritual home of surfing. It also represented a rare opportunity for one of Gaza’s young men to fulfil their sporting potential. Arafat is part of arguably the most isolated surf scene in the world. A 30-strong band of young men cut off from the rest of the international surfing community. Theirs is a world of battered boards, polluted water, poverty, conflict and a way to forget about the hardships of living in occupied Palestine. He is the first Gazan surfer to ever visit Hawaii. In fact, he is arguably the first surfer to leave Gaza on a surf trip of any kind. Gaza’s problems, of course, are well known. A year after last summer’s war with Israel, the strip is still in ruins. According to Oxfam, at current rates of reconstruction it could take more than 100 years to complete essential building of homes, schools and health facilities unless the Israeli blockade is lifted. Many of the young men who surf with Arafat worked as volunteers in hospitals, or with press teams during the conflict. Some, such as Taha Bakir, lost family during one of the most controversial bombings of the war: a missile attack on the harbour in Gaza City that killed four of his young cousins. The boys had all been playing hide and seek amongst fishermen’s shacks. “I have to try and send the answers before the power cuts,” adds Mahmoud ‘Moody’ Al-Riyashi a few days later. He is another surfer and a friend of Arafat. We have been trying to make contact for a few weeks – through Facebook, voice messages, Skype, email. Facebook Messenger’s audio messaging has proved to be the most successful. Olsen is the founder of Gaza Surf Club. Originally formed in 2008, his goal was to create a surf-based project that would eventually expand into a year-round ocean education programme for children, and although a lot of his ambitions have been thwarted, the club now has approximately 30 surfers. All of them use boards donated from abroad and delivered by Explore Corps, the non-profit organisation also formed by Olsen. All of them work as lifeguards on Gaza’s beaches. Is it difficult for them to surf? There are two main groups of surfers in Gaza, says Olsen, although both tend to remain in their own areas and have little or no interaction. One group surfs at the beach in front of the harbour in Gaza City, the other about two miles south in the neighbourhood of Sheik Hazdien. It is there that you will find Arafat, Al-Riyashi and their friends, most notably at Coffee Time, a cafe run by Arafat’s family. On an average day, if the surf is good, the surfers will rise early and head to the beach at sunrise. Work starts at 8am (an afternoon shift will lead to a later rise) and most take their boards to the lifeguard towers. Each can often fit in a small amount of surfing during the day, and although the waves off the coast of Gaza City are not great, they are big enough to have fun. Lunch usually consists of fish or crabs caught overnight in nets laid out at sunset and picked up by the lifeguards at sunrise. Someone will bring pita bread, they will make tea, and other lifeguards from other towers will come across to eat, depending on the size of the day’s catch. After work, those surfers who can afford to will spend the evening at a cafe drinking tea and watching football on television. Are there any female surfers? Isolation is one of the surfers’ biggest problems. Arafat’s trip to Hawaii was an anomaly. An anomaly that reveals Gazans’ essential imprisonment. Previous attempts by Al-Riyashi, who has been surfing off the coast of Gaza for 10 years, have been thwarted, in particular a failed attempt to attend a surfing workshop in Egypt via the Rafah Crossing. He did, however, manage to attend a workshop in Qatar in 2012, according to Gisha. 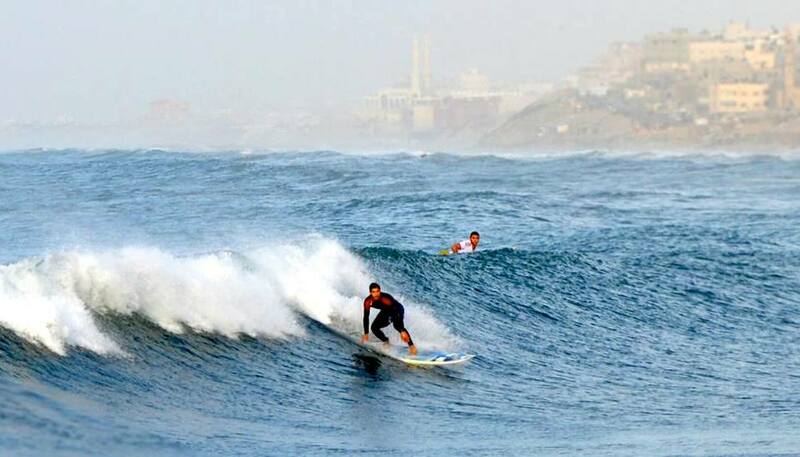 In contrast, Gaza’s prison warden, Israel, is home to the highest number of surfers per capita in the world. There has, however, been little or no contact between surfers in both communities for a number of years. This is in contrast to pre-2009 when the Surfing 4 Peace project donated surfboards to Gaza, facilitating direct communication between Israeli and Palestinian surfers. In 2009, however, the Hamas government made all contact with Israelis illegal and all official cooperation between the groups was forced to end. Although there is still contact between a few surfers on either side via social media, most contact is now conducted through third parties such as Explore Corps and non-Israeli members of Surfing 4 Peace, a community born in the Middle East but with no HQ except for its European division based in Paris. Although Surfing 4 Peace operates as a ‘cross-border co-operation initiative’ that seeks to ‘bridge cultural and political barriers through surfing’, one of its primary goals has always been to find ways to get surfboards, wet suits, surf wax and all kinds of surfing paraphernalia into Gaza and into the hands of its surfers. Efforts to get this equipment to Gaza have often been painstakingly slow. When the organisation was first launched in 2007 a partnership between Gaza Surf Relief (based in Santa Monica, California), Surfing 4 Peace and Explore Corps sought to import and distribute equipment donated by Gaza Surf Relief. During the summer of 2008, the majority of that equipment was delivered but a ban on the import of surfboards to Gaza by the Israeli army meant that only four of the surfboards could be delivered. It took a further two years of negotiations for Explore Corps to secure permission for the rest of the boards to enter Gaza. The complexities of Gaza’s internal politics and the levels of corruption have also damaged the sport’s advancement in the strip. According to Olsen, in the past there have been problems with ‘influential’ individuals who have tried to take over the surf scene in Gaza by allying themselves with the police, confiscating equipment and demanding money from foreigners wishing to meet the surfers. Both groups of surfers – those by the harbour in Gaza City and those in Sheik Hazdien – are concerned that the other is working with these individuals, creating an issue of trust between what is essentially a tiny surfing community. “For the first few years of the club the primary obstacle was the inability to bring surfing equipment into Gaza due to the Israeli embargo,” says Olsen. “But since 2010 the main problem has been with the Hamas government and its corrupt system of handling sports development and sporting donations. Sports in Gaza are used as a source of income for corrupt officials and their friends and the ministry uses its authority to give full control over everything surf-related to its friends. The idea is that one person or ‘charity’ is given control of all existing surfing equipment and all future donations and serves as the sole legal contact for media and perspective donors. That charity then uses its control of equipment and its exclusive access to apply for donor money to support the sport. Any money received is then pocketed by the charity and never used for its intended purpose. If a donor visits Gaza, the charity will distribute the equipment and hold an event and will quickly take back the equipment once the donor leaves. Olsen has been involved with the club for seven years, much longer than he ever anticipated. Is he disillusioned? “Frankly, I never planned on being intimately involved with the project for this long,” he admits. “My goal was to establish the club, build up its strength and international contacts and then to transition it into a local independent association. Afterwards, I wanted to expand out to larger projects in Gaza, including establishing a national sea scouts programme to teach sailing, water safety, swimming etc to large numbers of kids. For this reason Explore Corps is planning to build and operate a small community centre for the surfers on a piece of private land in Gaza. It is hoped that it will house a communal space for meetings and the hosting of guests, a room with tools and materials for repairing surfboards, computers for online research and learning about the wider surfing community, and a retail space for surf and water sports-related goods. As someone who is married to a surfer, I know the power that this sport has on an individual… During hard times it can give you inner peace, and like what my husbands says it is also allows you to be a part of the Earth in a different way. Beautifully written article. Then ask yourself: Do all articles really have to include the lines ‘over 80% of Gazans are refugees ethnically cleansed into that tiny densely populated strip first in 1948 and then in a second wave of ethnic cleansing in 1967 by zionist terrorist gangs who stole their land to create israel’? And ask yourself, after reading all of the above, can a conclusion be reached other than Israel is an abomination? That it has stolen Palestine, displaced the inhabitants of that land, forced them into prisons, brutalised them and forced them to accept their own dispossession? Then ask yourself, perhaps, can Palestinians not try to live their lives? Can they not surf, race, dance, shoot films and create art? Are these not forms of resistance too? These are truly free-spirited surfers. great post. surf’s up. Is the surf club still going strong ?